There are more than 200 burial mounds in Tokyo. The tomb mound consists of two lower stages in square shape in plan view and of a single upper stage in circular shape; thus the type is called jo-en kahofun (tomb mound with circular mound on upper stage and rectangular mound on lower stage). As per size, the lowest mound is ca. 32 m on side, the second mound ca. 23 m on side and the uppermost mound has a diameter of ca. 16 m. The structure for funeral is so-called stone chamber with a horizontal hole, which was built by lining cut stones. The total length is ca. 8.8 m, and the structure consists of 3 chambers. were excavated due to grave robbing and others, but a metal tip attached to a sword casing was excavated. The metal tip is decorated with silver Damascening. supposedly dates back to the middle to the latter half of the 7th century, on the ground of the shape of the stone chamber and characteristics of the metal tip. with circular mound on upper stage and rectangular mound on lower stage which are identified in investigations. And it is said that the mound is likely to be the biggest and oldest one among the four mounds. Moreover, since the tomb mound is one of the largest ones in Musashi area of this period and it has a large-sized stone chamber, it is likely that the buried person was one of the most powerful chieftain in Musashi. Another interesting subject will be a link to Musashi Kokufu (Provincial Office of Musashi Province) and Tosando Musashimichi (Musashimichi branch of the Tosando main road), which were constructed immediately later.
. Koishikawa 小石川 - Bunkyo ward . Shiba Maruyama Kofun is a tumulus that is a 106-meter-long zenpo-koen-fun (a keyhole-shaped mound). 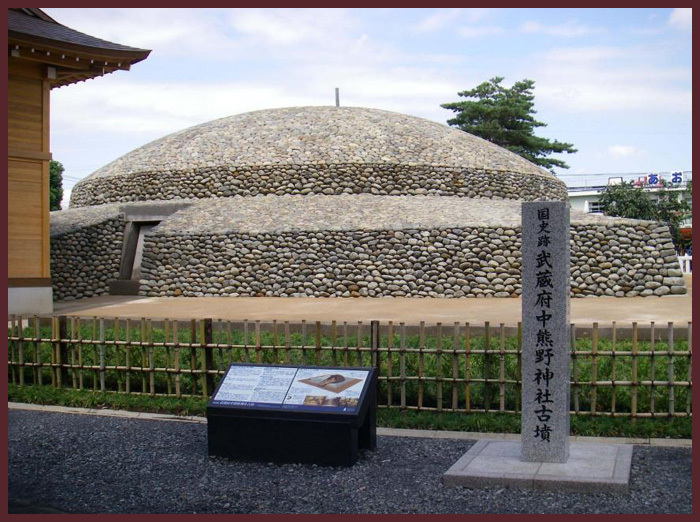 It is said to be the largest tumulus in Tokyo with the circular part at 64 meters in diameter, the square part at 40 meters in width at the front, and the narrowest part between the circular and square parts at 22 meters. It is located on the hill at a height of 16 meters above sea level with its frontal part facing south-southwest. Its original shape has been significantly damaged; particularly, the top and the back circular parts have been scraped off. 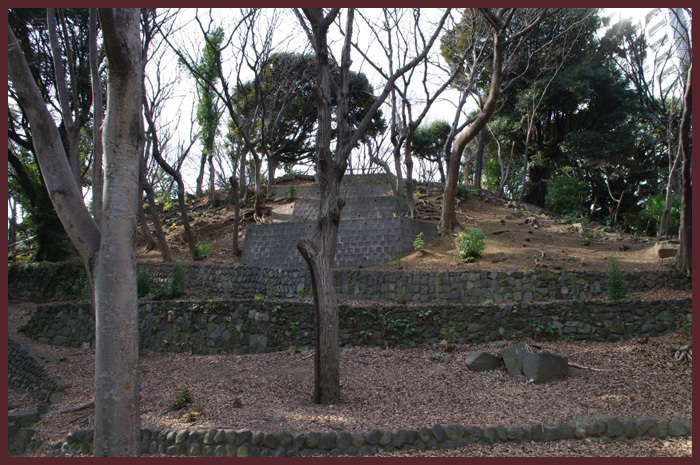 When Japanese archeologists investigated the tumulus in 1898, the main part (the burial facility), thought to have been at the center of the back circular part, was already lost. The corpse and its accompanying burial goods were also missing. From the shape of the frontal part, which is lower and narrower, as well as the condition of the site, it is estimated to have been built in the 5th century. It was designated as an Important Historical Property of Tokyo in 1979. It is within walking distance from both the Toei Subway Mita Line Shiba-koen Station and the JR (Japan Railways) Yamanote Line Hamamatsucho Station.